Nowadays, we are witnessing a transition from physical togetherness towards networked togetherness around media content. Novel forms of shared media experiences are gaining momentum, allowing geographically distributed users to concurrently consume the same media content while socially interacting (e.g., via text, audio or video chat). Relevant use cases are, for example, Social TV, networked games and multi-party conferencing. However, realizing enjoyable shared media services faces many challenges. In particular, a key technological enabler is the concurrent synchronization of the media playout across multiple locations, which is known as Inter-Destination Multimedia Synchronization (IDMS). This PhD thesis presents an inter-operable, adaptive and accurate IDMS solution, based on extending the capabilities of RTP/RTCP standard protocols (RFC 3550). Concretely, two new RTCP messages for IDMS have been defined to carry out the necessary information to achieve IDMS. Such RTCP extensions have been standardized within the IETF, in RFC 7272. In addition, novel standard-compliant Early Event-Driven (EED) RTCP feedback reporting mechanisms have been also designed to enhance the performance in terms of interactivity, flexibility, dynamism and accuracy when performing IDMS. The designed IDMS solution makes use of globally synchronized clocks (e.g., using NTP) and can adopt different (centralized and distributed) architectural schemes to exchange the RTCP messages for IDMS. This allows efficiently providing IDMS in a variety of networked scenarios and applications, with different requirements (e.g., interactivity, scalability, robustness…) and available resources (e.g., bandwidth, latency, multicast support…). Likewise, various monitoring and control algorithms, such as dynamic strategies for selecting the reference timing to synchronize with, and fault tolerance mechanisms, have been added. Moreover, the proposed IDMS solution includes a novel Adaptive Media Playout (AMP) technique, which aims to smoothly adjust the media playout rate, within perceptually tolerable ranges, every time allowable asynchrony thresholds are exceeded. Prototypes of the IDMS solution have been implemented in both a simulation and in real media framework. The evaluation tests prove the consistent behavior and the satisfactory performance of each one of the designed components (e.g., protocols, architectural schemes, master selection policies, adjustment techniques…). Likewise, comparison results between the different developed alternatives for such components are also provided. In general, the obtained results demonstrate the ability of this RTP/RTCP-based IDMS solution to concurrently and independently maintain an overall synchronization status (within allowable limits) in different logical groups of users, while avoiding annoying playout discontinuities and hardly increasing the computational and traffic load. Montagud Climent, M.A. (2015, March 2). 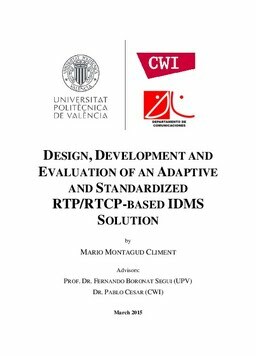 Design, Development and Evaluation of an Adaptive and Standardized RTCP-based IDMS Solution.